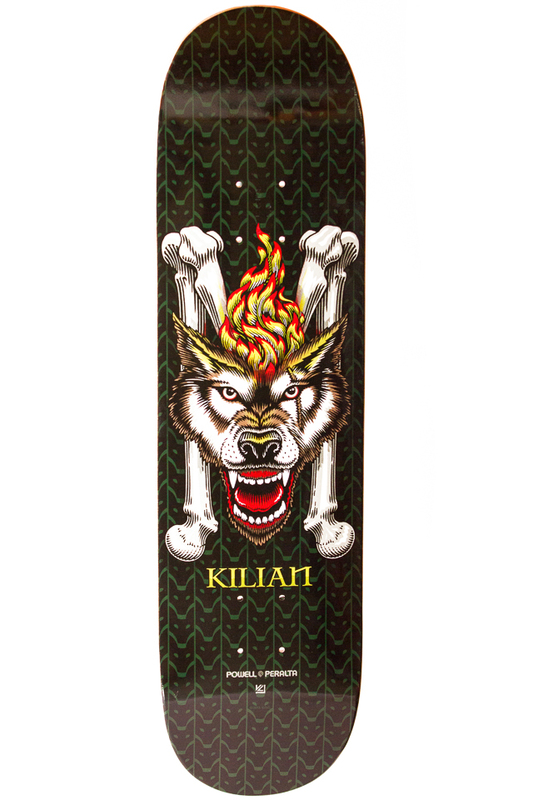 The Powell Peralta Kilian Martin Freestyle Board is an 8″ wide street deck built to the specifications of the freestyle king himself. This shape comes in at 31.45″ long, with a nose kick of 6.75″ and a slightly shorter tail at 6.5″, as well as a 14″ wheelbase. Pressed with Powell’s mellow K20 radial concave mold, the board offers a solid pop and moderately sized standing platform for most street, freestyle, and park applications. This deck isn’t crazy complicated, but it provides the essentials for the common skater and proves to be a freestyle machine that will go as far as you push it. Check out more from Powell Peralta Here! The Vans SK8-HI MTE DX Skate Shoes are a revamped update on the classic high top design that topped the ranks for years. With the MTE design, this series comes with a weather resistant build, that has also proven the shoe to last longer in our experiences. The blacked out version we picked up features a durable suede and canvas uppers and a nylon styled midsection that adds to the build. With their waterproofed scotch guard protection and vulcanized sole these shoes are built to handle all adventures, but we find that these features prove more than useful in our skating as well. The vulcanized sole actually gives us a bit of a stickier feeling to the board when boosting hips and with the extra rubber material, allow the outer soles to last a good bit more. There is a somewhat reinforced toe-cap to the MTE that provides a subtle yet prolonged difference in wear, and the stitching and lacing is beefed up as well. The ultracush soles help to absorb shock without feeling overly squishy or in-the-way. Also, that flannel lining doesn’t just look badass, it’s hella comfy and along with the padded high-top collars make ankle-biting boards a fear of the past. That bloody credit carded ankle from earlier doesn’t feel so great, huh? By the way, I’m not writing this all as some sort of internet-crazed affiliate shoes-salesman… these are my personal kicks and I’ve been rocking them for a good bit. They’re legit! Check out more from Vans here! The Pro-tec Certified Fullcut Helmet holds the same design and comfort of the classic full-cut dome, but provides a hard foam lining that meets CPSC standards and provides greater protection for high speed impacts. The classic full-cut look has always held its appeal with its vintage style and slim design, and it’s now back and rated to have an anvil-equipped robot beat it to hell, er, save your brain. No kidding though, this line of helmets has been fully tested and approved to save some brain matter in the case of a gnarly spill, and Pro-tec has partnered with the power of science to make an overall safer dome. Beyond the improved safety of these full-cut’s, they are comfy, stay in place, and come in a few different designs to appeal to whatever your style may be. The matte gray above stood out to us with its ‘murica colored striping, but we’ve also been rocking the gloss white collab helmet with art from Mark Gonzalez, and have our eyes on the gold, silver flake, and matte black alternatives. 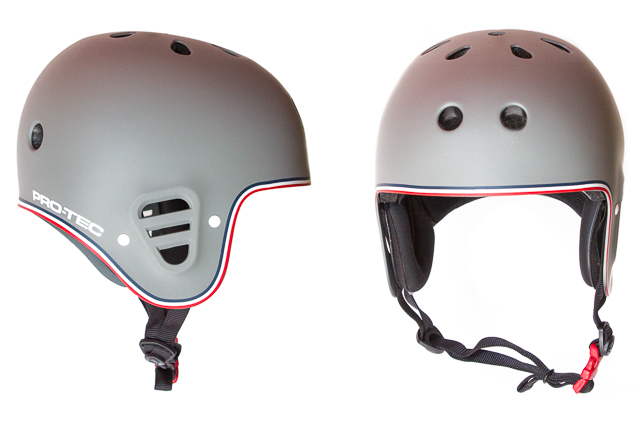 This helmet is fitted with a comfy sweat-wicking liner, and with a solid buckle strap, stainless steel hardware, and plenty of vent holes make it snug & secure. Worry no longer about your helmet sliding around or offering sub-par protection, Pro-tec’s got your back. Check out more from Protec here! The Powell-Peralta Tail-Bone & Rib-Bones Slider Rails are the original in board protection and sliding performance that Powell brought to skaters years and years ago. 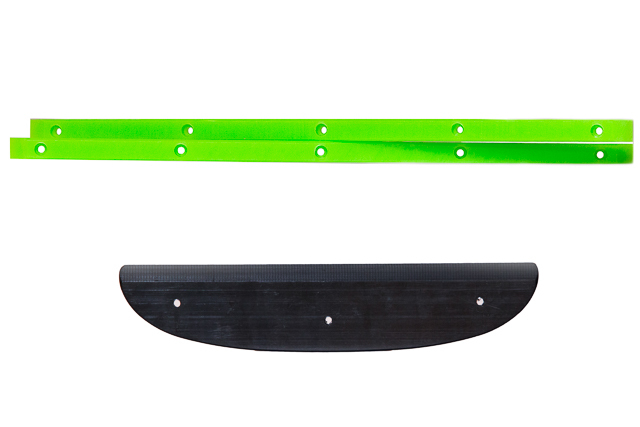 With a classic 80’s vibe, the rail and tail sliders don’t just look fresh, but add a little life to pool and freestyle decks while making board slides that much slidier. 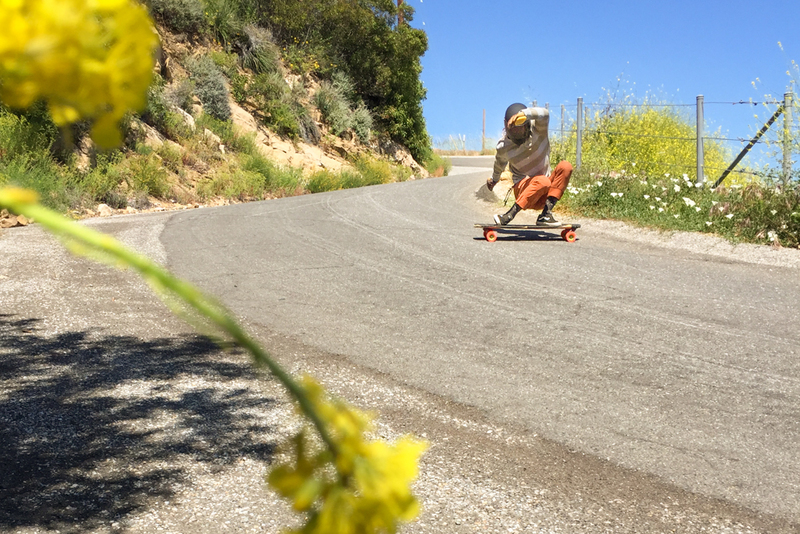 The UHMW polyethylene formula behind these “plastics” means that they last longer and provide a very predictable and reliable slide throughout various slippery-rip tricks and crusty-coated features. Add a classic touch to your next setup, and a little more slip to your slide! 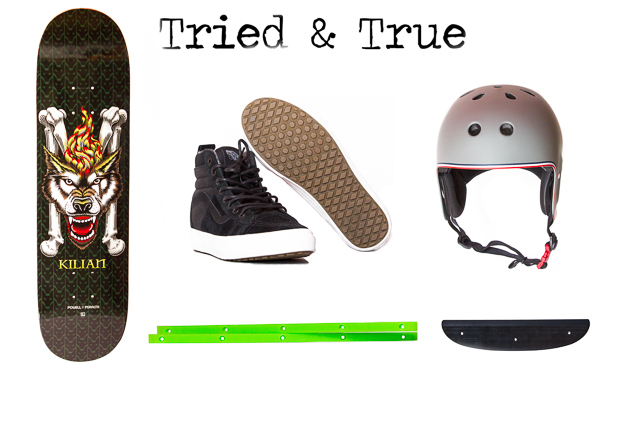 Here’s to a new year (still the same ol’ us) and pushing quality skate gear over that other Bull@%#! 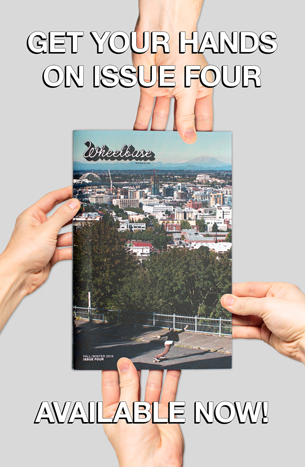 Thanks for checking in, and keep it classy wheelbase fam. Be sure to stop back in next month as well for the February collection… We have some cool stuff brewin’!